(Left to right) First-year medical students Sneha Goswami, Krish Suresh, Jessica Quaggin-Smith, Max Kazer and Carla Berkowitz performed CPR on a man at Lake Shore Park. During a break between classes at Lake Shore Park, five first-year medical students saved a man’s life – and performed CPR for the first time. “There was a split second of fear, because we’re first-year medical students, and we’d only practiced on mannequins, but we realized if we didn’t do anything then he would die,” Jessica Quaggin-Smith said. 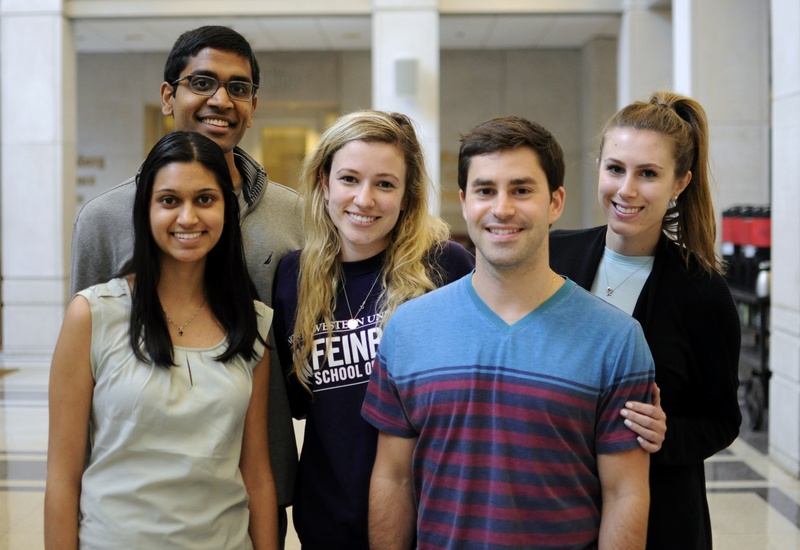 Quaggin-Smith and her fellow first-year medical students, Carla Berkowitz, Max Kazer, Sneha Goswami and Krish Suresh, attributed their actions in the park to a basic life support course they took during the first week of medical school at Northwestern University Feinberg School of Medicine’s simulation center. Berkowitz was the first to spot the man in distress, noticing that he wasn’t breathing or moving. Berkowitz, Kazer and Quaggin-Smith approached the man and checked for a pulse. When they didn’t find one, they lowered him to the ground to begin CPR while a bystander called 911. Kazer initiated chest compressions while Goswami, Suresh and a nearby emergency medicine physician came over to join. They alternated delivering chest compressions until paramedics arrived, who were able to restore breathing and a pulse. The man was taken to Northwestern Memorial Hospital’s Emergency Room, and the students visited him and his family the next day.